Even as digital becomes an increasingly essential part of Americans’ news diets, local TV continues to be one of the most-turned-to sources for news. In 2014, it even grew its average viewership. A close examination of the broadcast schedule suggests one reason why. Faced with multiple years of audience declines during traditional time slots – indeed, morning, early evening and late night news on local TV affiliates have lost on average 12% of their viewers since 2007 – many local TV stations began expanding their programming to nontraditional hours such as very early morning, midday and at 7 p.m., according to a Pew Research Center analysis of Nielsen data. These additions are finding at least some new audiences willing to tune in. The number of stations airing news at 4:30 a.m. was up 18% in 2014, to 320 (counting ABC, CBS, NBC and Fox affiliates as well as independent stations). Fully 357 stations had a 7 p.m. newscast in 2014, up 13% from the year before. And 328 stations aired local news at midday – an 11% increase from 2013. There were more than 800 news-producing local TV stations (commercial and English-language) in the U.S. last year, according to consulting firm BIA Kelsey. The 7 p.m. time slot carries special appeal for local stations as it immediately follows networks’ national news programs. In 2014, that time slot saw the biggest growth among the three nontraditional time slots studied here, enjoying an 11% increase from the year before. 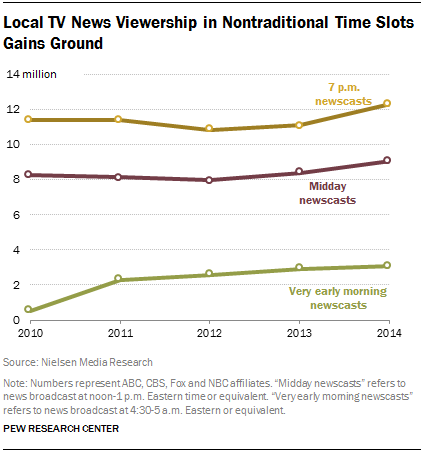 Over the past five years, newscasts on network affiliates in the 7 p.m. time slot have grown their audience by 8%. Very early morning news also continued to grow in 2014, though the rate has slowed somewhat. Newscasts at 4:30 a.m. saw a 6% boost from the year before. This increase comes after 4:30 a.m. viewership more than tripled in 2011 (up 337%) and saw a 13% increase in both 2012 and 2013. 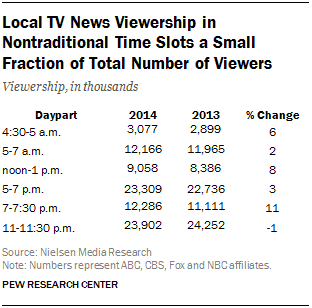 Local TV stations have also added midday newscasts, which gained viewers in all sweeps periods in 2014. The average audience grew by 8% in 2014, the second year in a row midday newscasts’ viewership has increased. Still, the total number of viewers for these dayparts accounts for a small fraction of the total number of viewers traditional time slots get. For example, newscasts at 4:30 a.m. averaged just 3.1 million viewers, compared with 23.9 million on average for 11 p.m. news, the most-watched time slot. This presents a challenge for stations turning to these scheduling strategies in efforts to improve revenues. It remains to be seen whether growth at nontraditional time slots will, in the long run, make up for declines at traditional hours.